Bread is one of the most fundamental parts of our diet, yet so many of us rely on bland grocery-store offerings when flavorsome breads can easily be made at home. 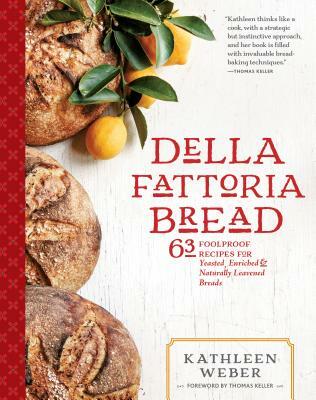 Della Fattoria Bread teaches readers to make the popular breads of this award-winning bakery. More than an instructional guide, the book takes the fear out of bread baking,and encourages bakers to draw on their senses, experiences, and instincts. Weber’s teachings are homespun and based on passed-down wisdom, not on finicky science or dull kitchen textbooks. The book is filled with invaluable bread-baking secrets, including starters and proper techniques, and features recipes for all levels of bakers. Beginners can learn to bake yeasted breads using pans. Advanced bakers can jump right into making free-form loaves of naturally leavened breads in all shapes and flavors. Other chapters include recipes for enriched breads like brioche and challah; pre-fermented breads, including baguettes; and crackers, breadsticks, naan, and more. The book includes recipes that incorporate the breads, too, such as Tomato Bread Soup and Della Fattoria’s famous Tuna Melt Piadina, along with the stories of the bakery and the unique family that has run it for nearly 20 years. Kathleen Weber opened Della Fattoria in 1995 after years of obsessively baking bread at home. Some her first clients included The French Laundry and the Sonoma Mission Inn, which quickly put Della Fattoria on the map. In 2011, Bon Appétit named the bakery one of “America’s 10 Best Bread Bakeries.” The business has grown to include a café in downtown Petaluma and a stand at San Francisco’s Ferry Plaza Market. Located on a working ranch in Petaluma, California, Della Fattoria is run by Kathleen; her husband, Ed; and her children, Elisa and Aaron. Weber is the author of Della Fattoria Bread.